Since 9/11, beginning with the Bush administration and continuing in Skippy’s, the U.S. government insists that the number-one terrorist threat America faces comes from al-Qaida. Yet an FBI agent who conducts counter-terrorism training, William Gawthrop, teaches FBI affiliates in law enforcement the – HORRORS! – very politically incorrect notion that it is the ideology of Islam that is the root problem. The FBI has publicly declared that its counterterrorism training seminars linking “mainstream” Muslims to terrorists was a “one time only” affair that began and ended in April 2011. But two months later, the Bureau employee who delivered those controversial briefings gave a similar lecture to a gathering of dozens of law enforcement officials at an FBI-sponsored public-private partnership in New York City. 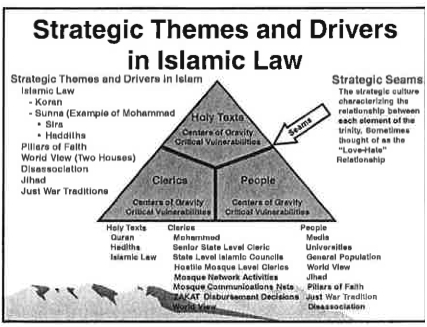 And during that June presentation, the FBI’s William Gawthrop told his audience that the fight against al-Qaida is a “waste,” compared to the threat presented by the ideology of Islam itself. “At the operational level, you have groups such as Hamas, Hezbollah, al-Qaida. Like teeth in a shark, it is irrelevant if you take one group out,” Gawthrop said during his lecture to the New York Metro Infragard at the World Financial Center in downtown Manhattan. This June 8 lecture is controversial in a different way. In Gawthrop’s worldview, the struggle against al-Qaida is really just an afterthought in a broader war. The group that knocked down the World Trade Center and rammed a jet into the Pentagon is a mere distraction. These are the professional assessments of a representative from the nation’s top domestic counterterrorism agency — a man considered so expert in understanding militant strategy that the FBI had him training agents on the subject. The best strategy for undermining militants, Gawthrop suggested, is to go after Islam itself. To undermine the validity of key Islamic scriptures and key Muslim leaders. The president and CEO of New York Metro Infragard, Joseph Concannon, told Danger Room that Gawthrop spoke in front of “60, 70 people,” mostly from law enforcement. Concannon says an organization affiliated with Gawthrop, the American Military University, recommended the analyst to New York Metro Infragard after vouching for his expertise. At the start of his lecture, Gawthrop told his audience that he was speaking in his capacity as a private citizen, not as an FBI analyst. His lecture featured an army.mil e-mail address, not one from the FBI. Gawthrop also said that he was discussing Islam and the Prophet Mohammed “as an ideology, not as a religion,” in order to stay in-bounds of the First Amendment. Gawthrop compared that Islamic “ideology” and its adherents to a “paper with iron filings on the top,” brought into contact with a “very powerful magnet,” which moves the iron filings back and forth. The iron filings “for the purposes of this discussion” are Muslims. […] In a statement issued to reporters Thursday, the FBI said very delicately that “this particular training segment” occurred “one time only, at Quantico and was quickly discontinued.” That might be literally true — for the briefings that Gawthrop delivered to FBI counterterrorism agents at Quantico. This entry was posted in 9/11, Culture War, Islam, Military, Religion, United States, US Presidents and tagged Al-Qaida. Bookmark the permalink. Americans need to stay vigilant,watch these dark characters-open borders has made Americans–sitting ducks. Along with our tolerant government thinking these evil hell spawn should come here to live. Everyone of them might as well know they are not welcome here. Islam thinking they are going to force a universal religion,sharia law and take the west-Huge mistake. Leave the same way you came. That is asking nice the first time. Gawthorpe is correct: Islam is a cult political movement, not a religion of peace. McCarthy was also correct as history has confirmed. I’ll see your Jihad and raise you a Crusade. I have been screaming this for years, and I am nowhere near an expert in this area.